The press thinks a Jack the Ripper copycat is responsible for a series of recent homicides; an unexpected situation emerges; Rosalee and Adalind work together on fixing Juliette's condition. *Renard has another blackout & mystery bleeding, finally goes to see Henrietta for help but storms back out in a panic, and then Henrietta gets her throat cut by the mystery-Ripper. *Juliette used the trailer fire to draw everyone away from Nick & her house, so she could secretly email Nick's Mom to trick her into coming back. *Adalind tests the hexenbiest suppression potion on herself (why???? ), and then Team Grimm tries to get Juliette to drink it voluntarily (why?????? ), and she flips the hell out and destroys the potion and uses her powers to make Nick maybe shoot Monroe. That Juliette did something as seemingly earth-shattering as burning down the trailer as a cover for doing another bad deed was kind of delightful. But then the writers went and undercut the power of the fire by having just the right book needed for this episodes wesen-of-the-week plot miraculously escape the flames. 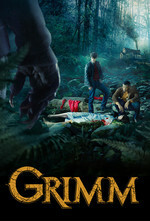 When, really, they had so much going on this week I don't think they even needed a procedural sub-plot, they could have just left the books destroyed and made finding a new Grimm stash an arc for next season. Adalind drinking that potion was so out of character -- after all the trauma she went through to get her powers back last time? I guess they're setting up for her to be Nick's love interest? Could not believe that their entire plan was to convince Juliette into drinking the potion voluntarily - I guess Dark Helmet was right. Is there a reason Monroe couldn't just move out of the way? It's not like Juliette was keeping him locked in place. Anywayyy. I'm enjoying everyone's reactions to Nick impregnating Adalind. So much so that I really hope the entire city of Portland gets told. Except the dead people. That's just pointless exposition. Oh, and from a look the AV Club comment thread, I see I have missed the obvious about the Ripper plot - that it's possessing Renard in his blackouts. Certainly makes Henrietta's murder less of a WTF moment. I guess they'll have to find some way to power Adalind back up now that they've squandered the rest of the potion. Except that it seems like they're basically just planning to swap Adalind's role and Juliette's role. Adalind gets to play love-interest for a while and Juliette gets to be the evil, problem-causing, working-with-the-Royals Hexenbiest. I'm pretty meh on the whole thing; Nick & co. being stupid enough to think Juliette would drink the potion voluntarily is just the latest in a long series of wildly illogical contortions they've gone through to get where they're going. FWIW I'm not sure there's any way to get an uncooperative person with telekinetic powers to drink anything; it's not like you can hold her down and force her to swallow it when she can telekinetically hurl you across the room. I guess you'd have to trick her into drinking it which seems....difficult. It did occur to me that the Ripper might be Renard. If they're going to say that the Ripper is some kind of possessing-spirit that predates "Jack the Ripper" they're going to need to explain where he picked up that over-the-top British accent, though. Yeah, I've been assuming Renard was Ripper. The "back in town" line fits with possession. I wonder about the clothing change, though. He never wakes up wearing something else. Maybe Jack really is "from Hell" and demons just all speak in British accents. I would be completely on board with that explanation! Unless Adalind's and Sean's Hexenmessiah baby uses her powers to purge Juliette and save the day. When Adalind finished her seizure, she didn't say "I'm okay". She said, "I'm good". Yeah, she's doing a Spike.